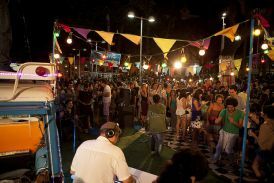 After a cultural exchange spanning Bristol and Recife, and a fantastic weekend Showcase with interventions, inspiring talks, an exhibition preview, workshops and a playable street party, Recife: The Playable City is now over, but it will have ripples for years to come. The programme was conceived about two years ago as a collaborative development scheme and festival showcase. We wanted to bring together practitioners from Brazil and the UK to collectively consider the future of our cities, to make connections, to develop new ideas, to exchange skills, to engage audiences with emerging digital works – and this seemed like the perfect way to do it. We are immensely proud and hugely excited about just how successful the programme has been. 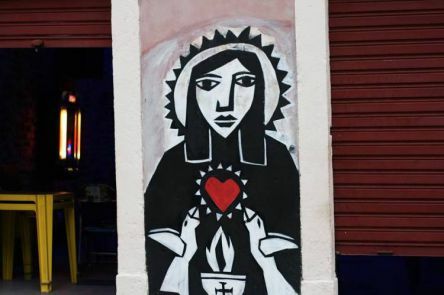 The practitioners involved were absolutely fantastic and everyone who came along to our events in both Bristol and Recife, had a great spirit of openness, and were keen to converse. 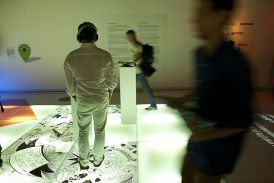 The programme received great press reviews from Wired in the UK and many journals in Recife (you can see scans and links to articles on our Facebook page). We will also post films from the Showcase on this website very shortly, but in the meantime, you can check out our Storify and Flickr to see some great images, and watch our interim project film to find out more. The exchange was divided into two parts. Part one in Bristol centred on generating a collective idea of what a Playable City could be, whilst part two in Recife had a much more open structure, with a focus on defining ideas in project groups, and developing practice. 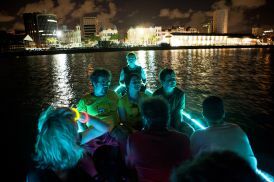 Aquatic Pathways explored how the waterways of Recife could be used for transport, as the roads are very congested. The project used Google Maps to ask audiences to select spots in the city where pick up points might be useful, as well as creating interactive lighting on the beautifully painted skiffs (boats) to make them more visible and more playable. Press Play / Toca Aí was designed to create connections between people and music, through objects installed on city walls that triggered sound as people touched them, whilst Telescope for a Beautiful City wrapped stories into a kaleidoscope, triggering audio as it was picked up, which complemented the reflections in the view finder. 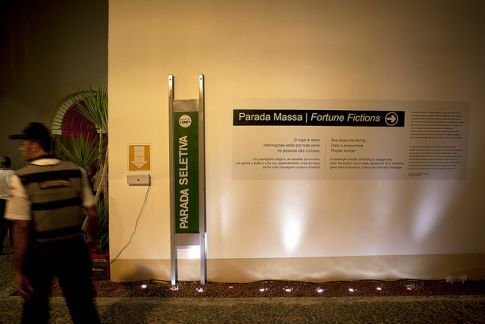 Fortune Fictions took place in Recife’s bus stops. Whilst waiting for buses, commuters were invited to press a playful button, triggering their fortune to be told. 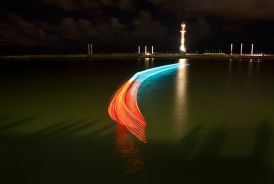 These fortunes reflected Recife’s open data such as traffic density, weather and pollution levels, connecting citizens with the condition of their city, whilst creating a magical moment in their day. Finally the Woman in the Wall took the form of a guided theatre experience, in which audiences ‘walked in the skin’ of a woman, who was allegedly bricked into a wall by her father, for falling pregnant out of wedlock. 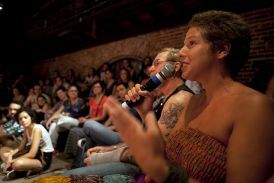 Featuring performance, phone messages, physical clues and more, this theatrical tour of Recife’s Rua do Apolo, was a truly enchanting experience, provoking participants to consider Recife’s past, present and future. The ideas were fantastic and participants are already looking at ways to develop them further. I feel however, that perhaps the biggest success of this programme is the process itself. Each participant went on a very personal journey, (often reflected in their project journals). The process of developing ideas quickly, with people you have never met before, in a short space of time, in (for some) an unknown city, navigating languages, navigating cultural idioms, and showcasing unfinished ideas in a public sphere, is hugely challenging. It takes a great deal of resilience, generosity, understanding and patience. It can be stressful, but is also hugely rewarding. I think every single participant learnt something about themselves along the way. 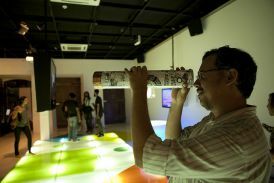 From the UK: Lighthouse (Brighton), Cornerhouse (Manchester), Site Gallery (Sheffield) and National Theatre Wales (Cardiff). And from Recife: CESAR, UFPE (the Federal University of Pernambuco), the Gilberto Freyre Foundation and VOXAR. And finally massive thanks to Fina Produção, whose work on production and logistics in Recife was absolutely integral to the success of the programme. We are truly thrilled with the impact of the programme and the network it has established. There are many things that could happen as a result. Connections: There is already a legacy in terms of connections between participants and partners. I know this will remain and I believe we will see its ripples for a long time. Ideas: There were many great ideas that emerged from the programme and I’m pretty sure we will see some of them again. One – Press Play / Toca Aí – has already been shortlisted for Bristol’s annual Playable City Award. 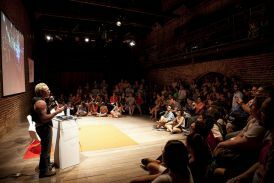 Recife as a Playable City: The Showcase sparked a huge amount of interest about the notion of Playable and what it could mean for the city of Recife. We even had a fantastic impromptu meeting with the city Mayor on the day of the Showcase, about the potential of the programme. It feels like there are many more conversations to be had, on the continued development of Recife as a Playable City. A global network of Playable Cities: This programme has also proven that there is much that cities around the world can learn from each other. How we forge ahead to build a productive, global network of Playable Cities, is an exciting question.